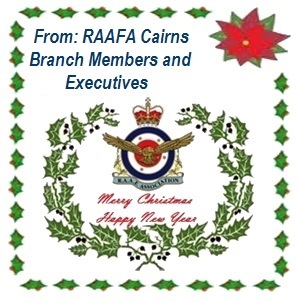 From and To; The Cairns Branch Members Executives and all who visit our site. Greetings and salutations all, well as the year draws to an end we the members take this opportunity to pass on our good wishes to you all, Merry Christmas and a very Happy and prospers New Year and we will see you all in the new Year, or communicate electronically as we do now days. To our webpage visitors if you are a resident in the Cairns region please consider becoming a member, and to all other visitors if you are visiting the Cairns region we welcome you last but not least be safe during the festive season and we look forward to seeing you all in the New and exciting year ahead, Pervenire ad Sidera et Ultra. Lest we forget.